The use of rosehip oil is well known for its natural therapeutic effect but finding original rosehip oil-based products is a real challenge. It is quite a costly essential oil as it is extracted from only a specific type of rose and these roses aren’t exactly in every garden across the globe. The rosehip oil is a unique, fixed-type (non-volatile), and delicate herbal oil containing several skin-friendly ingredients such as essential fatty acids, vitamin C, vitamin E, and B-carotene. This herbal oil is used as therapeutic face oil and is suitable for all skin types. Apart from facial skin, rosehip oil is also ideal for the treatment of dry and chapped skin. It is so delicate in quality and texture that even new-born babies are pampered with the massage of rosehip oil. Those who are suffering from chronic skin problems due to ultra tenderness and sensitivity of skin can benefit from light massage with rosehip oil and it will give them permanent comfort. It is best used as carrier-oil-blend massage oil for body and raw for the facial skin. It can be used any time of the day and should be used after proper skin cleaning. You need to take 2-3 drops of oil and apply it on your target skin area. It is for external use only. Now that we know the therapeutic qualities of pure and organic rosehip oil, let’s check out the special features of Rosehip Oil from Majestic Pure to understand its overall benefits and efficiency. Rosehip Oil for face, nails, hair and skin from Majestic Pure is a standard-quality organic herbal massage oil. The oil has many therapeutic effects and it improves skin glow, reduces skin blemishes and skin scar caused by acne, sun tan, and uneven skin tone. Rosehip oil of a special rose quality is introduced in market as majestic versatile oil. It can be used for hair care too for cleaning oily scalp, dandruff, scalp flakes, etc. Regular massage with this oil on finger and toe nails is extremely beneficial for the nail health. It is available in 4 oz. bottle. 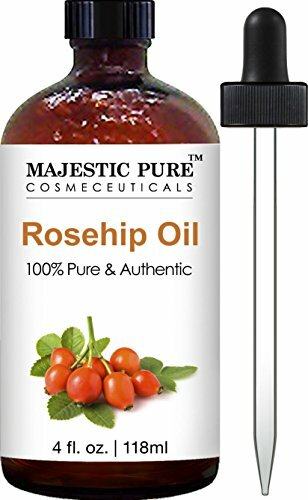 Rosehip Oil for face, nails, hair and skin from Majestic Pure is grade-1 anti-aging natural oil that, with regular use, prevents fine lines, wrinkles, and dullness of skin tone caused by improper nourishment. It is moderately priced which is indeed a great advantage. Organic Rosehip Oil - 100% Pure and Unrefined Virgin Rosehip Seed Oil. Rosehip Oil for face, nails, hair and skin from Majestic Pure is by far the most cost-efficient option. It is free from all types of additives. As it is a fixed kind of oil, it has a bigger shelf life which is good for the budget. This Majestic Pure product is and imported product. Its raw ingredients are imported from Chile. Rosehip Oil from Majestic Pure is indeed a quality herbal oil product and due to its organic compound, it is a fixed-type oil and comes with reduced chances of evaporation. It smells good and the smell is 100% chemical free. It is light in weight and can be used for complete skincare including nail, hair, and body. It is important to use this oil with carrier oils. You should keep it away from kids and eyes. Users have praised the Majestic Pure product for its efficiency and quality.